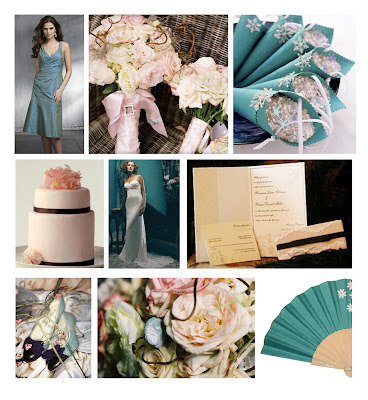 This color palette was inspired by this wedding dress from brides.com. I love the vintage feel the picture has so I tried to give the color palette a vintage look as well. Again, I was able to incorporate an invitation by Zenadia Design into the color palette and I am so excited about it! This color palette would be perfect for an evening affair in the spring or summer, or a lavish fall or winter wedding. Incorporating more pink into the color palette would definitely make it more spring friendly!